This week, I experienced my first taste of Carnival traditions, as tourists flock to Trinidad and Tobago, and the celebrations begin to climb toward the Mas frenzy on Monday and Tuesday! On Friday, we ventured into Port of Spain for the Dragon Festival and a small traditional Carnival performance. 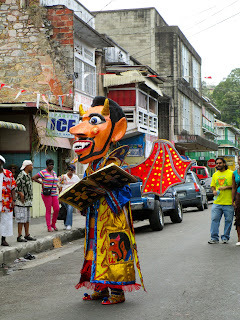 The whole concept of Carnival and "playing mas" or masquerade is about an elaborate performance of mimicry and masks. Some say Carnival takes "time out of time" by emphasizing fluidity in the passage of time and releasing revelers and all participants from the pressing matters of real life. 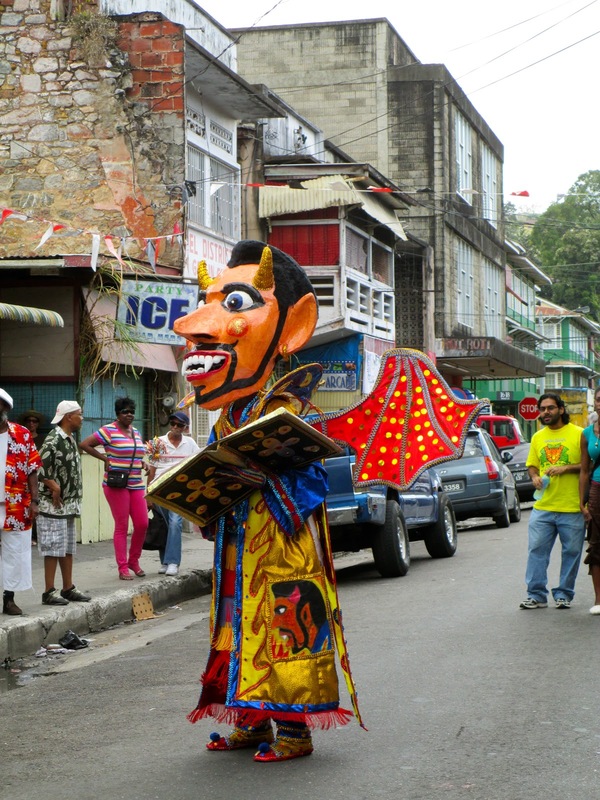 The characters seen in parades throughout the week are symbolic of the history of Trinidadian culture. The Bookman (also, Gownman or Ruler) is a devil mas portrayal, surrounded by imps and beasts. He carries a pen and a book in which he writes the names of prospective souls for the devil. While I watched the Bookman do his waltz through the streets, I caught a glimpse of names in his book. Some I did not recognize, but the name "Christopher Columbus" was immediately recognizable! Jab "devil" Molassie "molasses" is one type of devil in devil mas. He carries a pitch fork and his body is smeared in grease, mud, or coloured dyes (in this case- blue all over)! His imps play rhythms on pan drums, while he wines and gyrates wildly, held back only by a chain. The Dragon is the fire-beast from hell, bringing destruction to the streets. If the dragon comes across a pool of water in the road, the "holy water" being of Heaven leaves the Dragon frustrated. The imps taunt him and he must finally dance in submission and try with great effort to leap over the water. I was quite amused to find that one of the Dragon characters in the parade was incredibly intoxicated. His Dragon would have quite a struggle had he encountered any holy water in his path. He stumbled, dancing on his knees and appearing to fall headfirst into the ground several times. He also convinced someone to light his cigarette, which he smoked inside the costumed dragon head. All in all, his performance was perhaps the most amusing, feeling effortless, fun, and a little dangerous! I encountered a few more characters, but I will see the full lot at the big Carnival parades on Tuesday! Look for another more detailed post, including J'Ouvert and Mas.